Keto-Mojo Help Docs & FAQs - What are the Keto-Mojo meter specifications? 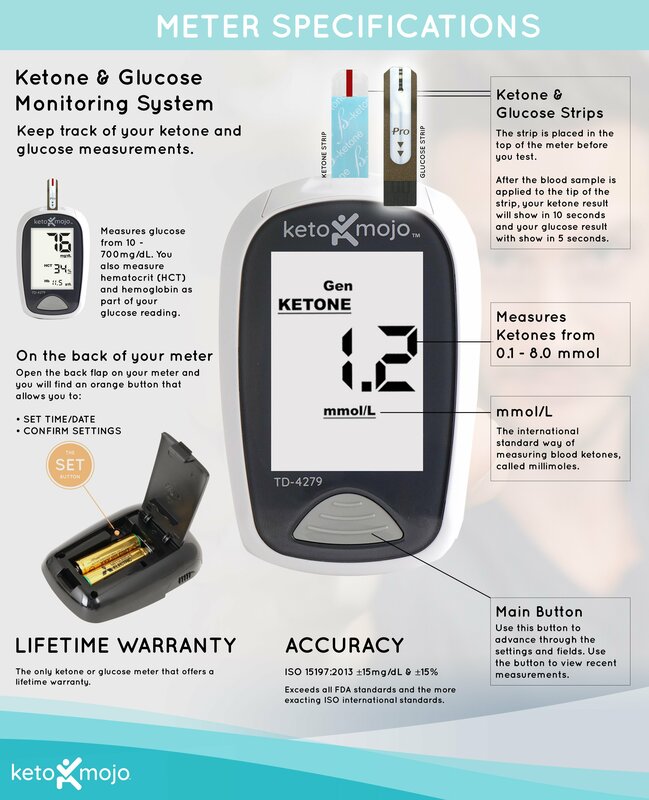 All Categories ​>​ Frequently Asked Questions, FAQs ​>​ What are the Keto-Mojo meter specifications? • 4 Daily Alarms ▫ keep consistency in measurements by testing the same time every day. • 7, 14, 21, 28, 60, and 90 days average function. • Large memory for 1000 tests ▫ review your readings over time. • Exceeds FDA and ISO 15197:2013 standards; approved for in vitro self testing of Type 1, Type 2 and gestational diabetes. • Calibration by code chip for ketones ▫ ensures accuracy. • Large back lit LCD display ▫ Easy to read in any lighting conditions. ▫ Power supply 2xAAA ▫ Operating conditions 10 ˚C ~ 40 ˚C, below 85% R.H.